Yap Tiong Peng is the first optometrist locally who works extensively on vision therapy. He has been in private practice since 2004 but he continues to serve as a part-time academic lecturer to share his clinical experience and knowledge (e.g. Singapore Polytechnic, University of Manchester, National University of Malaysia). He is a Senior Consultant Optometrist at IGARD Group Singapore. Being passionate with the role of vision in children with special needs, he attained professional accreditation in behavioural optometry in the UK and further clinical training in the USA in neuro-optometric rehabilitation and vision therapy. 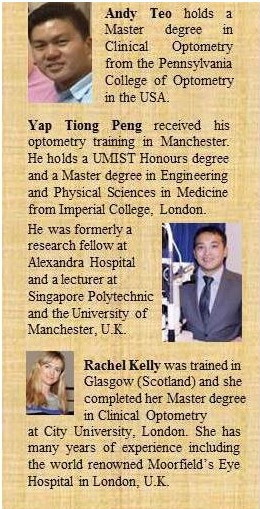 Tiong Peng received his basic optometry training in Manchester, UK. Qualified since 1998, he holds a UMIST Honours degree (Manchester) and Master Degree from Imperial College of Science, Technology and Medicine (London). In 2010-11, he was appointed to sit on the expert committee on vision therapy that was initiated by the Singapore Health Ministry. Tiong Peng is often invited to speak at regional conferences and he has published routinely. His work covers the cortical response in astigmatic amblyopia (COVD Poster, Las Vegas, 2015), binocular summation in children with amblyopia (ARVO Poster, Seattle, 2013), review article on vision deficits related to dyslexia (Medical Grapevine, Asia, 2012), utility value on visual floaters (American Journal of Ophthalmology, 2011), randomized control trial on efficacy of tropicamide in mydriasis (Asian Journal of Ophthalmology, 2006) and its effect on race and diabetes (Clinical and Experimental Optometry, Australia, 2010). Previously, he was a Key Opinion Leader at Alcon Inc. and a Research Fellow in the Department of Ophthalmology and Vision Science at Alexandra Hospital. Besides work, Tiong Peng actively contributes to the community through voluntary activities. Last year, he was part of a team of four local optometrists and other volunteers from the Lions Club to conduct eye checks and dispense prescription glasses in the rural villages in Siem Reap, Cambodia. He has also worked on a house building project in Indonesia and numerous community vision screening projects locally. 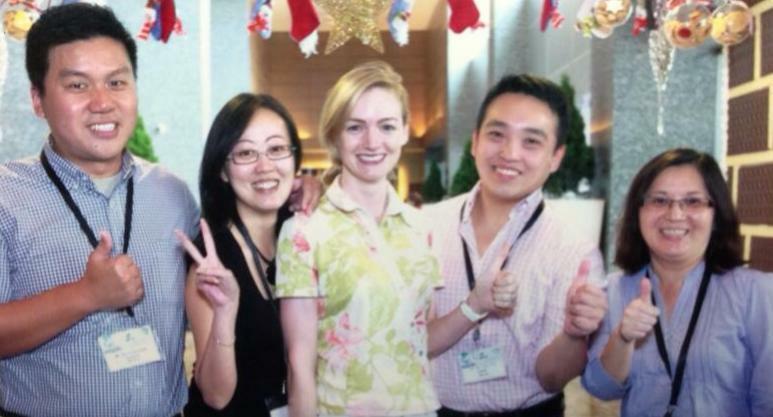 Rachel Kelly has been in Singapore for five years and she has actively contributed to the local optometry industry. She has been sharing her wealth of clinical knowledge and experience through a range of continuing education courses (e.g. the OOB-accredited course in Paediatric Optometry that was co-organised by IGARD Group and International Eye Cataract Retina Centre). That course has proved so popular that it has already been run twice in the same year. As a Senior Consultant Optometrist, she pioneered the use of orthokeratology refractive therapy for myopia control at IGARD Group Singapore. She has volunteered actively in numerous community vision screening projects such as the World Sight Day and social outreach vision screening programmes for the less fortunate children. On many occasions, she has written to The Straits Times to raise awareness of optometry in this country. She and her co-author, Yap Tiong Peng, has even raised red flags over the potential ill-effects of smartphone to the eyes and the excessive use of artificial 3D technology at home. Originally from Ireland, Rachel completed her Optometry training in Glasgow, Scotland, U.K. and further clinical training at City University, London, U.K. She holds a BSc(Hons) degree in Optometry, a Master degree in Clinical Optometry with distinction, a Diploma in Sports Vision and a professional membership (by examination) with the British College of Optometrists. She has many years of clinical experience in ocular diagnostics and therapeutics in London. She has previously worked at Moorfields Eye Hospital and has been the President of the North London Association of Optometrists and was the local optometric committee representative to the National Health Service (NHS) in the U.K.
Evelyne Saysana is a Senior Consultant Optometrist at IGARD Group. She holds a Bachelor and Master degree in Optometry from the University of New South Wales, Sydney, Australia. She completed her further training in Behavioural Optometry in Sydney, Australia, and she has substantial experience with children and continues to work part-time with the ophthalmology department at the KK Children and Women Hospital in Singapore. At IGARD, she sees children and adult for vision therapy and neuro-optometric vision rehabilitation. In 2010-11, she was appointed to sit on the expert committee on vision therapy that was initiated by the Singapore Health Ministry. Evelyne is an Australian and Singapore Permanent Resident. Isobelle Wong is a Senior Consultant Optometrist at IGARD Group. Following her qualification in the U.K., Isobelle spent many years of her professional career in both Singapore and Malaysia. She completed the full four years of optometry training in Glasgow, Scotland, U.K., and she is amongst the first globally to be cross trained in special educational needs and vision therapy.